I like small business professor Scott Shane’s work. It’s usually spot on and useful. Today’s analysis of small business job creation is an excellent example. Writes Scott, “Economists are not sure why small businesses are accounting for a smaller fraction of job creation and private sector employment than they used to. Some analysts point to the effects of rising health care costs and regulation, which tend to hit smaller companies more heavily than big businesses. Others focus on changing industry composition, pointing out that the real estate and construction sectors, where small businesses are more prevalent, have shrunk dramatically over the past two decades. “Still others concentrate their attention on the decline in bank lending to small companies, which historically have relied on bank credit as a source of capital. 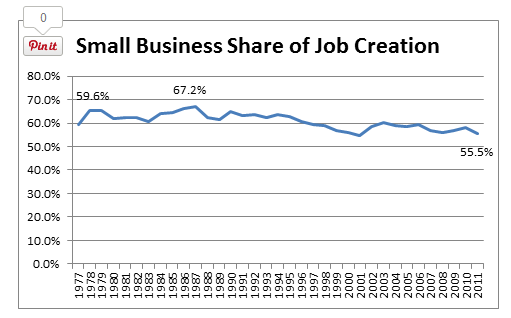 And some economists point out that the decline in small business’s share of job creation is really the result of increased job generation at big companies.